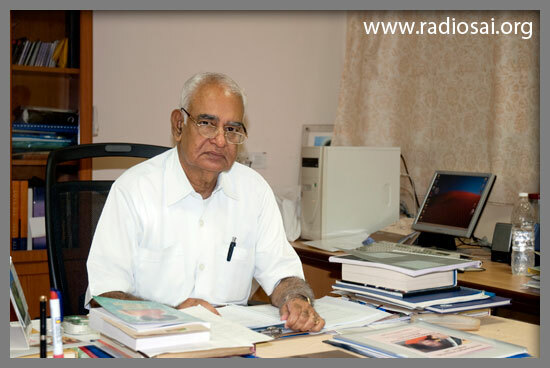 This is the transcript of a Radio talk delivered by Prof. G. Venkataraman which was featured on Radio Sai on January 6, 2012. In this latest musing, the distinguished professor shares his views about the types of problems affecting the world today making special reference to the gruesome Newtown shoot-out in Connecticut, USA wherein a school boy suddenly opened fire and killed 20 children and six teachers before taking his own life. He analyses the moot causes for such horrible occurrences and our duty in these troubled times in the light of Baba's teachings. Loving Sai Ram and greetings from Prasanthi Nilayam. It is a long time since I broadcast what might be called an occasional musings talk. Indeed for nearly three months now, I have not been in touch with you; I am sure many of you are aware of the reason. Firstly I was away from the end of August for about 5 weeks, travelling across New Zealand and Australia, wrapping up with a fleeting visit to Manila in the Philippines. I returned early October, after which the Birthday season absorbed all attention. Immediately following that, I had to do a rapid 2-week tour of Hong Kong, Southern China and Japan. I am now back, and with so much work staring at me I just cannot afford to be absent even for a day; on the contrary, I have to work overtime! However, that does not bother me as that is my normal routine. My only concern is about meeting the many demanding schedules, particularly because we are starting many new activities, besides expanding what we are already doing. Let me get down to business and begin by outlining what I propose to do in this talk. I shall start with a short comment on the two recent overseas tours, my first after 14 years. I shall then reflect on various matters of current interest, and wrap up with where we need to go as also what we all ought to be doing. As mentioned earlier, my first tour began in New Zealand. I had been there once before way back in 1995. Since then I have maintained good contacts with a few devotees there, which helped a lot during my recent second visit. Like last time I visited many places and gave talks. However, this time my tour was tailored to accommodate many talks and discussions with people outside the devotee circle. I am happy to say that this happened throughout the tour. Thus in New Zealand I not only addressed two public meetings but also gave a talk in a university and in a hospital as well as a school, besides talking to many people connected with education and healthcare. I also had the opportunity to have an extended conversation with two doctors engaged in compassionate healthcare, elders of the Maori community and a Member of the New Zealand Parliament. 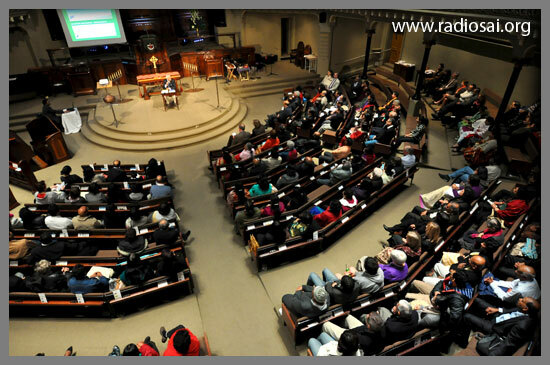 In Australia too I had a few interesting engagements, the most notable of which was a talk I gave in Melbourne on UN Peace day in a beautiful setting, an old church with a serene ambience. My Manila stay was hectic, with six engagements packed into one and a half days! If I managed it at this age, it was entirely due to Swami's Grace. My schedule included a talk at the Asian Development Bank and also at the Asian Institute of Management. I should not forget to mention that unlike I normally do, this time I had Power Point slides illustrating all my talks, which made a big difference, particularly when I spoke about the life and the mission of Swami. Word has got around and there has been a great demand for recordings of the talks delivered in New Zealand and Australia. Since the original recordings are of varying quality, I have decided to rerecord them as that is simpler. Of course, this exercise would take some time to complete, since I am occupied with many tasks, many of which go beyond Radio Sai. I should mention that though there was pressure to speak about my so-called experiences, I always stuck to speaking about Swami’s teachings. I explained that Bhagawan once told me emphatically, “People come here to see Swami and know about His Message. So in your talks, confine yourself to the teachings and avoid story telling.” That is what I have always endeavoured to do, not only when I spoke in the Divine Presence but also while speaking over Radio Sai. And over the years, I have found that the message too has plenty of takers. Naturally there are many memories associated with these two tours coming quickly after each other, but they are too many to be shared here. I shall restrict myself to recalling just a few, since they are symbolic of how Swami’s Love silently and imperceptibly pervades everywhere. When I arrived in Australia after a two week stay in New Zealand, I stayed for a couple of days on the Sunshine Coast on the East, with my good friend Douglas Saunders. I reached there on the night of a Wednesday. Next morning Doug drove me to a farm house up in the hills. It was a nice one hour drive through farm country. The farm house I was driven to belonged to Nigel Sims who came to Swami way back in the eighties. He could not afford many trips to Prasanthi but has remained totally dedicated to Swami in every possible way. Swami told him to have bhajan sessions on Thursdays and in the morning. Thus his sessions are at 10:30 a.m. Usually about ten people attend but on the day I went there, there were more than two dozen. All except me and a Sri Lankan were white Aussies. I was deeply touched by many things I saw there. For example, one lady had driven three hours to attend bhajan that day because she had heard I would be there. The visitors included two ladies who were both deaf and dumb but they wanted to be there that day. And there was a 88 year old psychologist (who has had amazing experiences) who made it a point to attend that morning. The bhajan hall was small and clearly modest, a huge change from all I had seen up to that point. Nothing was fancy, but that in no way made it less serene. Right in the middle was a framed panel containing the words of the Gayathri. In a corner was a statue of Ganesha, and I was told that one day a small mouse peeped into the bhajan hall, ran up straight to Ganesha, had a look and ran back out of the room! Nigel led the bhajan session, most of the bhajans being in English. However, in the middle came Manasa Bhajare, sung by Nigel himself. When the singing ended, there were passages that were read out, while those present reflected on what was read. After the formal session was over, I was asked to say a few words. Frankly, I was overwhelmed. For me it was a very special experience. I was simply stunned by the fact that someone in faraway India, someone who never went abroad except for one short trip to Africa and that too to visit the house of a devotee, that someone could inspire and fill these simple people in a different hemisphere with undying Love. All these people were vegetarians and did not drink or smoke. Their dedication to Swami and His teachings was total, which to me was awesome. On the whole, it was a remarkable story of how Swami’s Love can shine powerfully, no matter how far the devotees are in a physical sense. I had a similar feeling when after my talk in the Asian Development Bank, a Japanese gentleman (I was later told he was the number 3 man in ADB), stayed back to chat with me for over half an hour. He had seen World War II including the nuclear devastation it caused, and was therefore happy to talk about compassion and the need to tune social welfare projects so as to be in resonance with actual problems the beneficiaries face. What I am trying to say is that even a hard-nosed institution like the ADB which is like a mini World Bank for Asia, was impressed by what Swami had done for the poor without stretching out His hand or getting funds from IMF and agencies like that. One of the reasons why I am so keen about the teachings of Swami is the simple fact that if applied earnestly, there is no problem on earth that they cannot solve. This is not a glib statement; rather, it is a very calculated observation made on the basis of deep reflection about the many problems afflicting human society, in conjunction with a careful study of Swami’s teachings. If you think about it, there are basically two distinct categories of challenges that the human mind faces.